Sources: DCCCD, Student Public Interest Research Groups, U.S. Department of Labor. Graphic by Mateo Corey. Tuition could be raised by $20 per credit hour to cover the cost of textbooks and class materials under a plan proposed by the Dallas County Community College District Board of Trustees. Students would receive the materials on the first day of class as part of a deal between DCCCD and campus bookstore Follett. During a campus forum Nov. 5, DCCCD Chancellor Joe May said that when classes start in fall, students would receive the digital version of their textbooks automatically and have the option to purchase the hard copy for an additional charge. If the book is only available in the hard copy, students would get all new books, none used or loaned. Students would have the books bagged and pick them all up at one location. District Chief Financial Officer John Robertson, who presented the plan at the DCCCD Financial Committee meeting Oct. 2, said this would help students better understand the true cost of attending college because there wouldn’t be an additional textbook cost. “I think we complicate the financial side of going to school, and I think this makes what Dallas does very simple to understand,” he said. 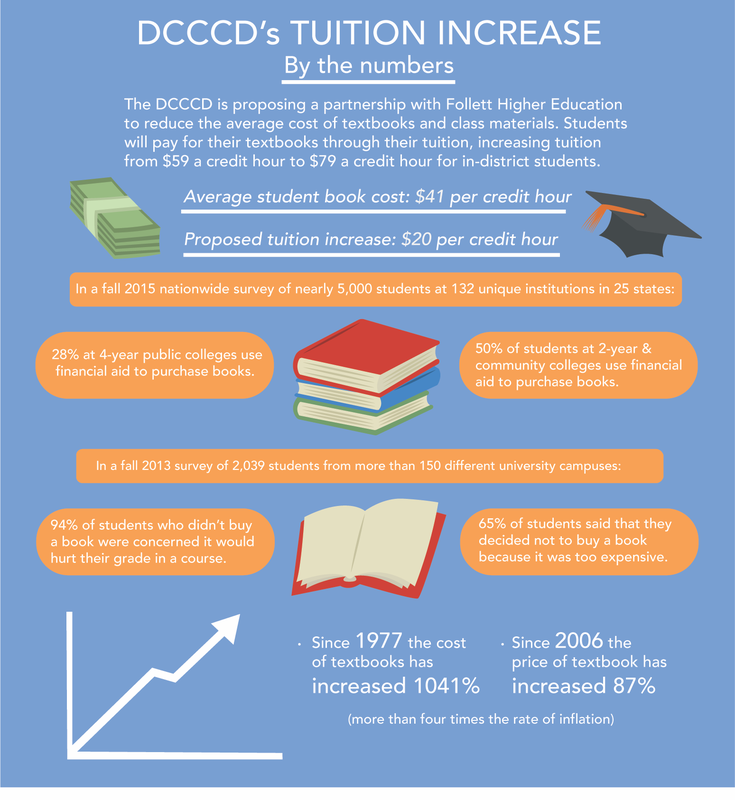 The average student book cost is $124 per three-credit class, and this proposal would cut the average cost in half at $60 per three-hour class, according to the DCCCD. Follett would provide a contribution of $2.5 million over a 10-year contract term. Student Jose Reyna said that while the proposal looks good on paper, he doesn’t always need books for his classes. “Having to always pay for the books seems a bit much,” he said. Robertson said he has been working on this proposal for two years, seeking a company that would be willing to work with the district, and that it eventually ended up being Follett. He said he would like to pilot the program at one of the DCCCD campuses during the summer. He said that he wants to keep tuition affordable and the district has the second lowest tuition in the state among colleges in major cities. It would still be $10 below the state average with the increase, he said. Robertson said that students who take a course that doesn’t have a textbook will eventually take a course that does. Even with the added $20 to tuition, it is still going to save students money, he said. Autobody major Zachary Zutter said that while this would be a way for people in academic programs like math or science to save money, books aren’t a large necessity for his major, so he doesn’t see a reason to increase tuition. He said he’s seen a lot of students in his program who struggle to pay the tuition they have now. Based on the credit hours they take, students in the automotive technology program could be paying about $340 more for their textbooks with the increased tuition, automotive technology professor Kevin Giles said. The books are normally $568. Giles said he has been voicing his concerns, responding to a number of emails from the chancellor with questions about the program. He said that although the change may benefit other students, it would be more expensive for his students. He said he is also concerned about what happens to the books if a student drops his class. His students purchase all of the books they need for the two-year program and use them all in their first class. If they drop, they could be walking away with $568 of books. Textbooks in the Follett bookstore at Eastfield College. Jesus Ayala/The Et Cetera. “We have a lot of students that come in, and after one or two classes they decide they don’t want to do this anymore so they quit,” Giles said. In an email sent Nov. 26 to clarify information about the proposal to employees, the DCCCD said even students in classes that use open educational resources would not be exempt from paying the new tuition. Government professor Stacey Jurhree said that it seems like a good idea only if students can have their books on the first day of class. With eight-week classes, he said students can’t wait until the third or fourth week to get their books. The faster pace means by that time, students would already be at risk for failing the class. He said that during this eight-week term he has students who claim they don’t have the book, and it shows in their work. He said an advantage is that this would balance the cost between some books, with math books generally costing much more than history or government books. Atziri Collazo, a psychology major said this proposal would help her, and the increase isn’t much at all. Robertson, the chief financial officer, said students who receive financial aid but choose not to buy books would now have the learning materials to be successful. According to the PowerPoint presented to the board on Oct. 2, nearly 83 percent of students agree they’d like to get course materials for a single reduced fee as part of tuition. Only 28 percent of students have all required materials on day one, and 77 percent of faculty use required textbooks in class almost every day. The most important factors for students when purchasing course materials were listed as: getting the best price (81 percent), my professor said I needed it (75 percent), convenience (63 percent) and how quickly they can obtain material (50 percent). The district could not point The Et Cetera to the source of that data, saying Follett provided the information. Follett did not reply to numerous calls and emails requesting the source of their information or methodology for gathering the numbers. Science major Andrew Kingsman said that the tuition increase would give students more incentive to pay for their books upfront rather than worrying about it later. He said he has seen students struggle with getting textbooks. 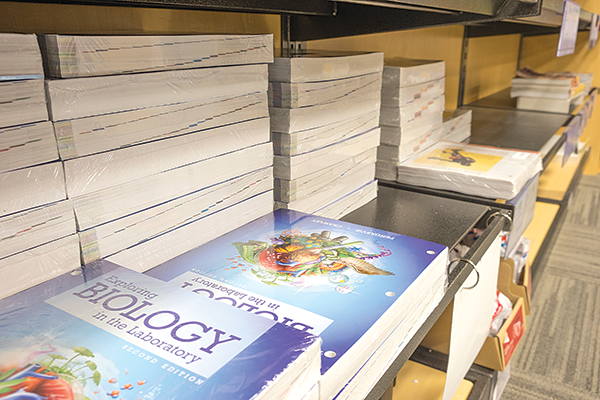 The district said the increased use of low or no-cost options for class materials would allow it to renegotiate with Follett in the future for a lower cost to students. Robertson said an advantage to the deal is that faculty can continue to use the same materials they’ve used for their classes before, but if it is available in a digital version they would need to use that one. He also said there are three things they can do to help drive down the price of textbooks: using open education resources, using the digital version of a book and standardizing textbooks across the district. Robertson said he has a team of about 15 people working with him to hear concerns from students and faculty and that he will continue to have meetings with Follett. He said that faculty haven’t been involved in the Follett deal itself because it is an administrative, contractual function of what they’re trying to do.